Contest: Rockstar Energy - Enter to win a Polaris RZR! 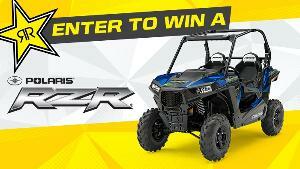 Rockstar Energy - Enter to win a Polaris RZR! Prize: Grand Prize Winner will receive: One (1) Polaris RZR 570. ARV: $8,500.00. Statistics: This contest was opened by 9 and entered by 1 ContestChest.com members. 11% of those who opened the contest, entered it.